Crotons with their colorful, glossy foliage and variation of leaf types are popular plants. It is a native of the tropics from Java to Australia and the South Sea Islands. 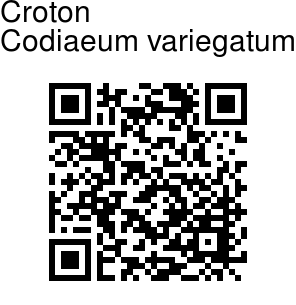 In the wild, garden croton is an evergreen shrub that grows to 10 ft tall and has large, leathery, shiny leaves. The cultivated garden crotons are usually smaller and come in an amazing diversity of leaf shapes and colors. 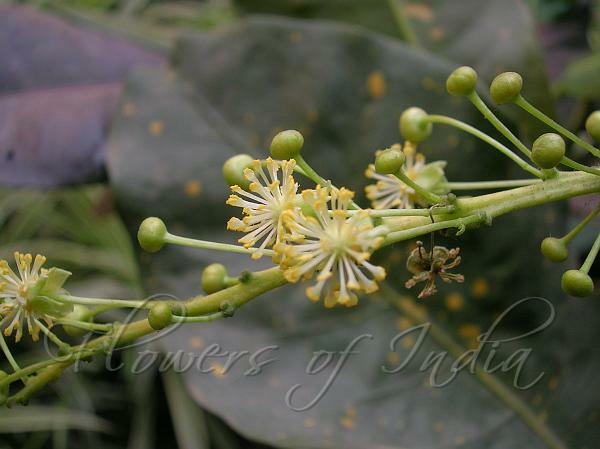 What they do have in common are rather thick evergreen alternate leaves, tiny inconspicuous star-shaped yellow flowers that hang down in long racemes, and a milky sap that bleeds from cut stems. Depending on the cultivar, the leaves may be ovate to linear, entire to deeply lobed, and variegated with green, white, purple, orange, yellow, red or pink. The colors may follow the veins, the margins or they may be in blotches on the leaf. Identification credit: Navendu Pagé Photographed in Delhi & Imphal.